This Edit Comment dialog is accessed from the Edit->Insert->Comment... menu item. It enables you to enter a new comment after any move in the game notation, the comment is inserted after the current move shown in the Game notation pane. If you wish to enter a comment at the start of the game you can select the Edit->Insert->Start comment... menu item. You can also edit any existing comment by simply clicking on the comment in the Game Notation pane. 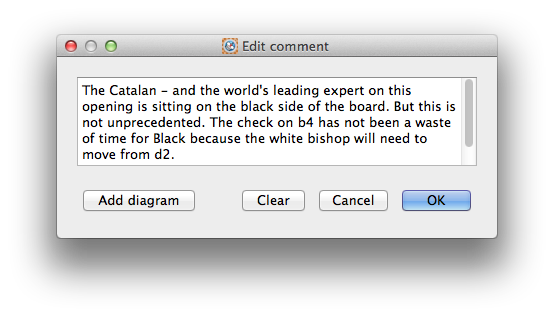 You can then edit it in this Edit comment dialog. While editing a comment the comment will be underlined in the Game Notation pane. You can clear an existing comment by using the Clear button. To add a diagram to the Game Notation for later printing select the Add diagram button. The diagram will be added at the cursor position within the text so you have flexibility about diagram placement within the text comment. This allows great flexibility over the printed game.